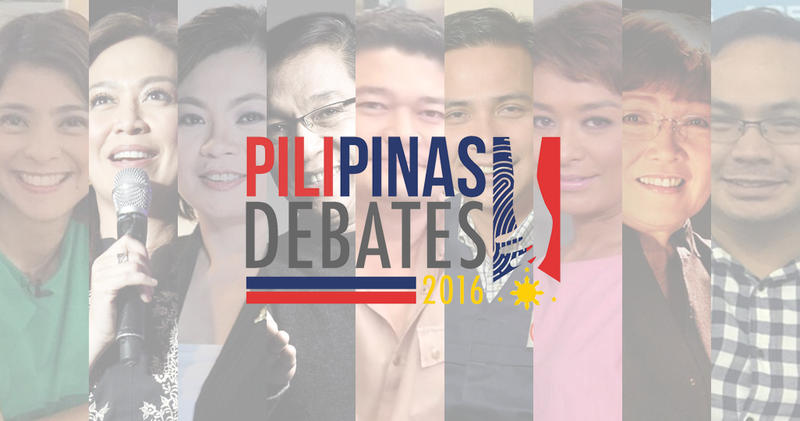 MNP Poll: Who should moderate the ABS-CBN PiliPinas 2016 Debate? As what has been announced in January, ABS-CBN in partnership with Manila Bulletin, will host the third PiliPinas Debate — the last debate of the 2016 election cycle. Happening on April 24, the debate will feature all of the five presidential candidates, namely Jejomar Binay Sr., Grace Poe-Llamanzares, Rodrigo Duterte, Manuel Roxas II, and Miriam Defensor-Santiago, in front of the audience at the University of Pangasinan. ABS-CBN has yet to reveal details about the debate, as well as its scope, but we were told that they are in the process of determining who will be the moderator or moderators of this momentous TV event. If we go by the network's Harapan series in the past election cycles, the most likely choices are TV Patrol anchor Ted Failon; and Bandila anchors Karen Davila, Ces Oreña-Drilon and Julius Babao. Other choices include The World Tonight anchor Tina Monzon-Palma; Mornings@ANC's Gigi Grande; Beyond Politics' Lynda Jumilla; and veteran correspondents Henry Omaga Diaz and RG Cruz. A key factor in the management's decision-making process is who among their talents can moderate an actual debate with little hand-holding, and who among them can help the network deliver the best debate of the 2016 presidential cycle. So, who do you think should be chosen as debate moderator/s? Let us know your top four (4) picks by voting in our MNP Poll below! We are leaving this poll open just in case you have a particular ABS-CBN journalist in mind. Be sure to also share us your comments below or join in the conversation on our Facebook page or on our Twitter account @medianewserphil.